Early in the morning, near the start of Winter, the sun comes up at just the right angle to throw some light on a small island in the James River near downtown Richmond while the trees on a larger island in the background are still in relative darkness. The light-toned bark of the trees on the small island provide an interesting contrast to the darkness behind them. Almost ghost-like in my opinion. I like how the two rocks in the river to the lower right provide a balance within the overall empty space near them. These rocks only appear when the river is low, at about 5 feet. Any rain at all is enough to cover them, it seems. Shot with a Nikon D600 and the third generation Nikkor 80-400mm zoom lens at 230mm. 1/160th sec @ f/9.0, ISO 400. Converted to a warm-tone black and white preset I created using Adobe Photoshop Lightroom. 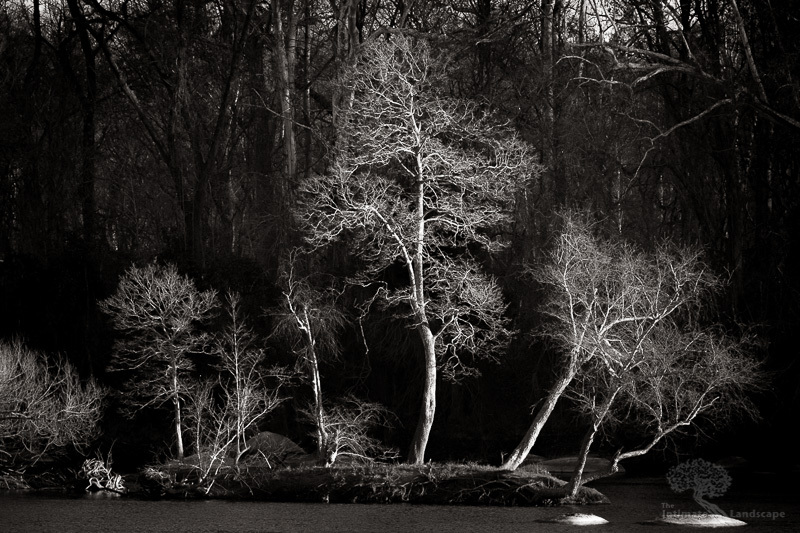 This entry was posted in James River, Landscape Photography and tagged James River, Trees.